Rosemary has been used in many cultures throughout the ages as a medicine and cure-all. The leaves contain flavonoids, proanthocyanidins, tannins, terpenoid bitters, phenols, acids and volatile oils. Rosemary is spicy, oily, diffusive, warming, drying, stimulating and an astringent. Rosemary stimulates the metabolism and helps the body to break down sugars and fats. It also stimulates the nervous system, and has a strengthening affect on the arteries, stomach, intestines, gall passages and heart while relaxing the sympathetic and voluntary muscles. Rosemary is helpful for those with weak peripheral circulation and low blood pressure as it helps to remove congealed blood, open capillaries and improve sensation. This helps to remove cold conditions from the limbs, including stiffness and soreness from arthritis and bruises and strains. Rosemary has a folklore reputation for boosting memory and giving courage and is thought to help with depression, nervousness and anxiety. Rosemary is an excellent culinary herb and is classically used when roasting meats or vegetables. For more medicinal quantities, rosemary can be made into a tincture with the fresh or dried herb. If using fresh material, use as high proof alcohol as you can find, with dried plant then 151 proof vodka is good. 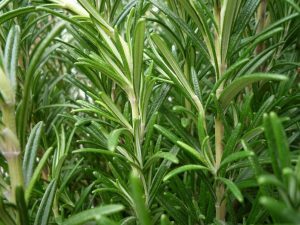 A basic tea of rosemary is good using fresh or dried leaves, I prefer to make a tea in combination with other herbs as rosemary has a very strong flavor. Externally, rosemary tincture, tea or fresh plant can be rubbed freely into areas of poor circulation. To stimulate a weak heart, rub into the heart region of the chest. In this rich rinse, the vinegar cleans, strips away old layers of grime and leaves hair silky and shiny. Nettles and rosemary add dark depths to the hair and nourish the scalp. Keep this rinse in the refrigerator in the summertime and use it in the outdoor shower for a cooling rinse. Warm it in the winter before using. Combine 1 cup dried nettle leaves and 1 cup dried rosemary in a pint jar. Warm 2 cup apple cider vinegar in a pan and pour it over the herbs. Allow it to steep overnight. Strain and reserve the liquid, add 1 teaspoon vegetable glycerin. Shake the mixture well. Use 2 to 4 teaspoons per shower instead of or after shampoo. Massage it into the scalp well and rinse. Cautions/Contraindications: Take caution with pregnancy except in food amounts. Not indicated for high blood pressure and headaches with hot bursting symptoms or in situations where a stimulant would be irritating.